Tigmanshu takes us into the world of Paan Singh Tomar and enlightens us the reasons that impelled a sportsman to take law in his hands. That itself is its USP, for this is no typical vendetta fare. It is a factual account of a sportsman who brought honor to the country, but felt betrayed when he needed the country the most. PAAN SINGH TOMAR is yet another masterstroke from a consummate raconteur. On the whole, PAAN SINGH TOMAR shatters the standard rules of this genre. Besides, the film makes you cognizant that serious cinema can be uniformly delightful, like any other enthralling entertainer. If this variety of cinema allures you then chances are that you will take pleasure in watching PAAN SINGH TOMAR. Recommended! In director Tigmanshu Dhulia's biopic, Paan Singh Tomar, the two worlds collide. And the result is a rather exquisite blend of drama, humour and tragedy; altogether eminently enjoyable good cinema. In a country obsessed with overpaid cricketers, a biopic on a former national champion athlete is reason enough to celebrate. But Dhulia's film is much more. It is one of superbly crafted film that underlines the linkage of life, sports and society. What's Good: The first half; the performances. What's Bad: The second half which is a routine revenge drama; the difficulty which the lay viewer will face while trying to understand the Bundelkhandi dialect in which the dialogues are spoken. 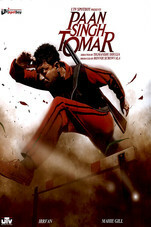 Verdict: Paan Singh Tomar does not make too much of a mark, thanks to the dull second half. Loo break: A couple after interval. Watch or Not? : Watch it for Irrfan Khan's performance and also for the other actors. The first half of the film has Tomar shining as an athlete for the Bengal Engineers regiment in Roorkee with many remarkable, convincing and well edited athletic scenes . In the second half, Tomar's post-army life is a messy tragedy for the man is drawn into a family argument over a plot of land. He had placed so much faith in the Indian army and the police force, but when all else fails he takes up arms to protect himself, his family, honor and more. Under Dhulia's direction, the transition of Paan Singh Tomar, the gentle athlete who carries a picture and memory of a Japanese female fan, and flirts with his wife (Mahie Gill ) in the sweetest manner, to the feared rebel, seems justifiable. As the audience, we stand by Tomar despite some heinous crimes committed by him and his gang,. Dhulia statement is clear -- in an unjust society, some crimes become a necessity!. PST reminds us never to forget that shame of India.